He is Major Perry H. Jefferson, U.S. Air Force, of Denver, Colorado. He will be buried April 3, 2008 in Arlington National Cemetery near Washington, D.C.
On April 3, 1969, Jefferson was an aerial observer on board an O-1G Bird Dog aircraft on a visual reconnaissance mission over a mountainous region in Ninh Thuan Province, Vietnam. The pilot of the aircraft, then U.S. Army First Lieuteannt Arthur G. Ecklund, radioed Phan Rang airbase to report his location, but contact was lost soon after. An extensive, three-day search and rescue effort began, but no evidence of a crash was found. Hostile threats in the area precluded further search efforts. In 2000, the remains turned over in 1984 were identified as Ecklund’s. Among other forensic identification tools and circumstantial evidence, scientists from JPAC and the Armed Forces DNA Identification Laboratory also used mitochondrial DNA and dental comparisons in identifying Jefferson’s remains. He died during the Vietnam war, but was never found. Major Perry H. Jefferson's family worried he had ended up a prisoner of war. "The thought of him wandering around in Vietnam was not a good one," said Jefferson's brother Michael. Michael Jefferson was asked for a DNA sample one year ago, after the Department of Defense says, a Vietnamese national living in California turned over human remains recovered from the site where Jefferson's plane went down. "That was the first thing after 30 years of not knowing anything," Michael Jefferson said. 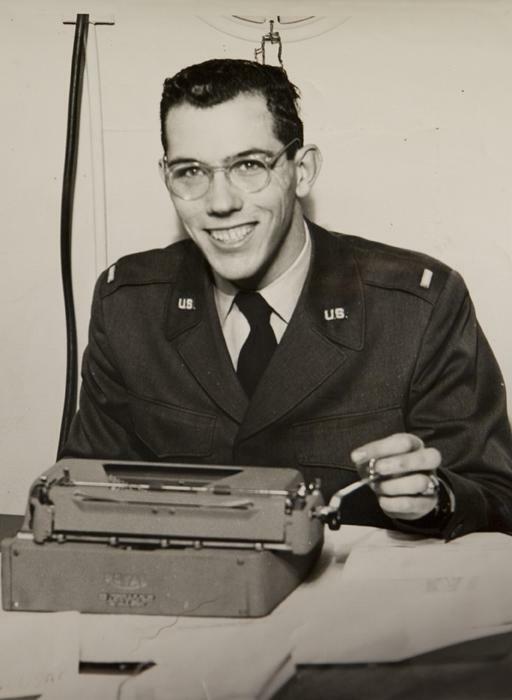 His brother was an aerial observer doing photo reconnaissance over a mountainous region in Vietnam, when contact with the plane was lost on April 3, 1969. "The best part of the whole thing was to know he actually died in the crash," Michael Jefferson said. Jefferson's family had saved newspaper clippings with headlines about heroes who did not return. Now, Maj. Jefferson's remains will return and be buried with full military honors at Arlington National Cemetery next April. His brother said this news offers hope to other families missing loved ones lost at war. "I hope people can get the closure I got. It's tremendous," he said. 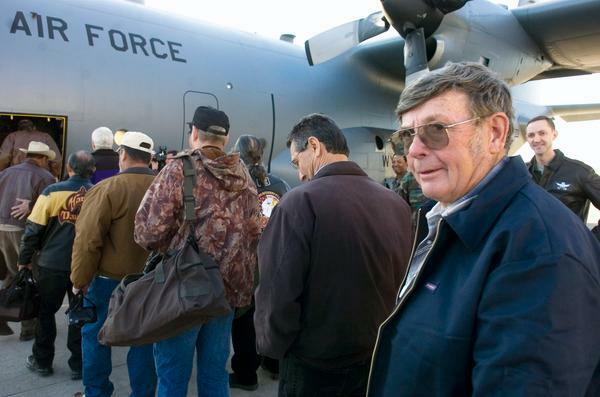 AURORA, Colorado — As the early morning sun filtered into the hangar at Buckley Air Force Base, Steve Jaouen looked at the dozens of Vietnam vets about to depart on a journey to pay tribute to one of their fallen comrades. remembrance ceremony at Virginia's Arlington National Cemetery for Major Perry Jefferson. "This will bring a lot of closure to a lot of people. It's been a long time. Thirty-nine years," said Jaouen. In the hangar waiting to board a Wyoming Air National Guard C-130 for Washington today were dozens of men from the Colorado Air National Guard's 120th Fighter Squadron who served in Vietnam with Maj. Perry Jefferson of Denver. Thursday at Virginia's Arlington National Cemetery, Jefferson will be laid to rest, seven years after a Vietnamese national living in California turned over to U.S. officials the remains that his mother brought with her when she immigrated to the United States. The remains were identified in December as those of Jefferson. The men gathered in the hangar all knew Jefferson, who disappeared on April 3, 1969, while on a intelligence mission in a 01-G Bird Dog spotter plane. He disappeared the day before he was to return home to the United States. "Perry was an optimistic high-stepper," said Jaouen. "He was friends to everybody. He seemed to always have a smile. He brought intelligence to military intelligence." When Jefferson disappeared, said Jaouen, there was hope that he had been captured or that he would simply walk out of the jungle and reappear, but it never happened. For such a tightly knit group — the first National Guard group activated in the Vietnam War — his loss was a blow on a personal and a unit level. "He was a good guy, a good guy," said Jaouen. Jefferson and pilot Arthur Ecklund had flown out of Phan Rang Airbase on that fateful day. The last time anyone heard from Ecklund and Jefferson was when Ecklund radioed that they were flying in the their Cessna 01 — called a "Bird Dog" — over the populated and forested mountains about 30 miles southwest of Cam Ranh Bay Air Base. They were never heard from again. Extensive searches did not find Jefferson or Ecklund. On Thursday, fighter aircraft from the Colorado Air National Guard will fly over Arlington National Cemetery in the missing-man formation as Jefferson's family, Jaouen and at least 100 other of Jefferson's colleagues in the 120th pay a final tribute. Thirty-nine years to the day from when he disappeared in Vietnam, Colorado's Major Perry Henry Jefferson today received a burial with full military honors. Family, a contingent of Vietnam veterans and retired members of Colorado's Air National Guard 120th Fighter Squadron commemorated Jefferson under a leaden sky with a cold wind whipping. More than a dozen veterans clad in leather jackets rode motorcycles to the service. "Maj. Jefferson honored the flag," said Chaplain Colonel (Retired) Victor Hoops, who served with Jefferson 39 years ago. Jefferson was the last member of the 120th Fighter Squadron missing in action in Vietnam. His remains were turned over to U.S. officials nine years ago by a Vietnamese national living in California, who reported that his mother had brought them with her when she immigrated to the United States. The remains were identified in December as those of Jefferson. Following a service at the cemetery's chapel, mourners arrived at the burial grounds. A military band carrying flags walked in slowly first, a drum beat growing louder as they approached. The clomping of hooves followed, as a horse-drawn carriage brought Jefferson's flag-covered casket. A rider on the first horse saluted. A group of about 50 walked behind, then gathered in a semi-circle around the grave. 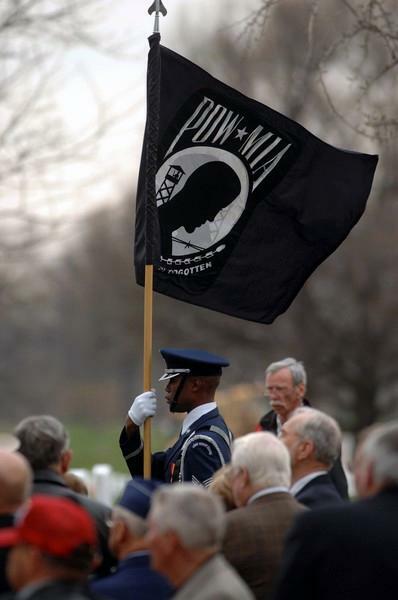 Chaplain Hoops approached the casket, followed by military members carrying a POW/MIA flag. Several in the crowd snapped photos. 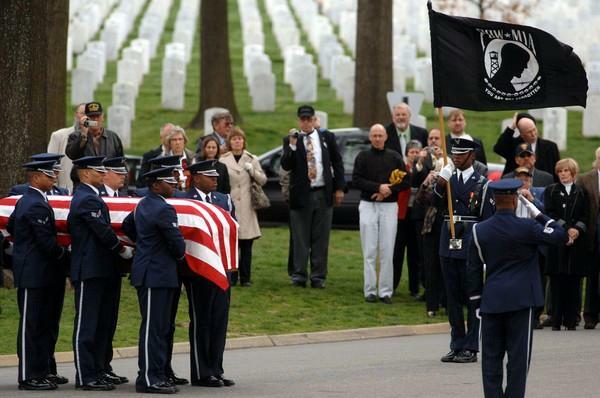 Military pallbearers carried the casket to the grave with the men carrying the POW/MIA flag walked behind. The men clad in leather jackets stood in a line across a small road from the grave site. Some of the men wore jacket with the words "Patriot Guard Rider and Riding with Respect" on the back. Others were clad in leather jackets reading "U.S. Military Vet." Hoops told mourners that Jefferson "answered the call of our country." After Hoops spoke, a slow, 21-gun salute sounded. Military members folded the flag, and Hoops knelt as he presented it to Jefferson's brother, Michael Jefferson. Hoops spoke to Michael Jefferson for several moments. A church bell sounded in the distance. Jefferson's grave lies a few feet from one with multiple soldiers killed in World War II. Next to Jefferson's grave is that of a man killed in Iraq in June 2007.